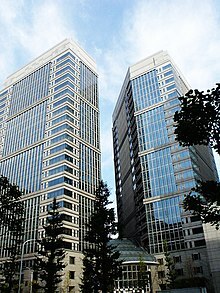 The Nippon Telegraph and Telephone Corporation (日本電信電話株式会社, Nippon Denshin Denwa Kabushiki-gaisha), commonly known as NTT, is a Japanese telecommunications company headquartered in Tokyo, Japan. Ranked 65th in Fortune Global 500, NTT is the fourth largest telecommunications company in the world in terms of revenue, as well as the third largest publicly traded company in Japan after Toyota and MUFG, as of September 2018. The company is incorporated pursuant to the NTT Law (Law Concerning Japan Telegraph and Telephone Corporation, Etc.). The purpose of the company defined by the Law is to own all the shares issued by Japan Telegraph and Telephone East Corporation (NTT East) and Japan Telegraph and Telephone West Corporation (NTT West) and to ensure proper and stable provision of telecommunications services all over Japan including remote rural areas by these companies as well as to conduct research relating to the telecommunications technologies that will form the foundation for telecommunications. Established as a monopoly government-owned corporation in 1952, Japan Telegraph and Telephone Public Corporation (日本電信電話公社, Nippon Denshin Denwa Kōsha) was privatized in 1985 to encourage competition in the country's telecom market. In 1987, NTT made the largest stock offering to date, at US$36.8 billion. Because NTT owns most of the last mile (FTTC or FTTB/FTTH), it enjoys oligopolistic control over land lines in Japan. In order to weaken NTT, the company was divided into a holding company (NTT) and three telecom companies (NTT East, NTT West, and NTT Communications) in 1999. The NTT Law regulating NTT East and West requires them to serve only short distance communications and obligates them to maintain telephone service all over the country. They are also obligated to lease their unused optical fiber (dark fiber) to other carriers at regulated rates. NTT Communications is not regulated by the NTT Law. In July 2010, NTT and South African IT company Dimension Data Holdings announced an agreement of a cash offer from NTT for Dimension Data's entire issued share capital, in £2.12bn ($3.24bn) deal. In late 2010, NTT's Japan-to-US transpacific network reached 400 Gbit/s. In August 2011, its network capacity was expanded to 500 Gbit/s. 2008 announcement of a new Medium-Term Management Strategy: "Road to Service Creation Business Group"
NTT Group consists of the following major companies, divided into five segments. NTT East, NTT West, NTT Communications, NTT DoCoMo, and NTT Data are most major subsidiaries. NTT DoCoMo and NTT Data are listed on the stock markets. NTT Urban Development is a subsidiary involved in real estate. NTT Security (integrating Solutionary (US), NTT Com Security (formerly Integralis), and Earthwave (Australia)). Chip Ganassi Racing in the IndyCar Series (affiliated with NTT Data, drivers include Ryan Briscoe, Tony Kanaan, Scott Dixon, Ed Jones, and Felix Rosenqvist). In 2019, NTT also became title sponsor of the series. ^ a b c d e f "Financial Results Release for the Fiscal Year ended March 31, 2011" (PDF). 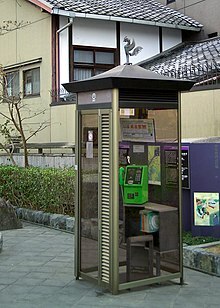 Nippon Telegraph and Telephone Corporation. May 13, 2011. Retrieved July 29, 2011. ^ "The Japanese National Property System and Current Conditions" (PDF). Ministry of Finance Japan. March 2013. Retrieved May 14, 2014. ^ "The World's Largest Public Companies". Forbes. Retrieved 2018-09-26. ^ "English translation of the "Law Concerning Japan Telegraph and Telephone Corporation, Etc."" (PDF). ^ Vartan, Vartanig G. (November 9, 1987). "Market Place; Big Stock Sale By Japanese". The New York Times. ^ "U.S. set to make $8 billion from bailing out Citi". 27 March 2010. ^ "NTT buys South Africa's Dimension Data". BBC News. July 14, 2010. Retrieved July 14, 2010. ^ Sean Buckley, Fierce Telecom. "NTT's Japan to U.S. network route reaches 500 Gbps mark." Aug 3, 2011. Retrieved Aug 4, 2011. ^ Melby, Caleb (March 13, 2018). "Kushner Conflict Cloud Hovers Over Brooklyn Sale Linked to Japan". Bloomberg News. A spokesman for the subsidiary, NTT Urban Development, said the company knew the deal involved Kushner Cos. The subsidiary describes itself as the real estate arm of NTT. ^ "NTT Communications Acquires 86.7% Stake in e-shelter, Germany's top data-center operator".